3. In so far as Central Deputation as per clause 1.1 under Rule 6(1) is concerned, instructions issued vide this Department’s OM No. 27(38)-EO (87 (SM) dated 20th May 1987 (copy enclosed) provide that on reversion from Central deputation, the officers concerned might be allowed leave not exceeding two months by the concerned Ministry / Department, and that the officer concerned should apply for further leave to the State Government / Cadre Authority. 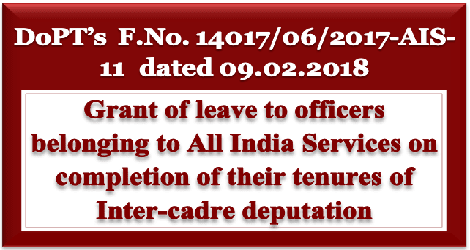 It is also to be stated that such leave is debitable from the leave account of the Officer.